Happy Friday! We have survived the first week of the new year –yay! If you were hit with the Arctic/polar vortex this week I hope you are thawing out. Do you love chocolate covered strawberries because these decadent rolls were inspired by them. 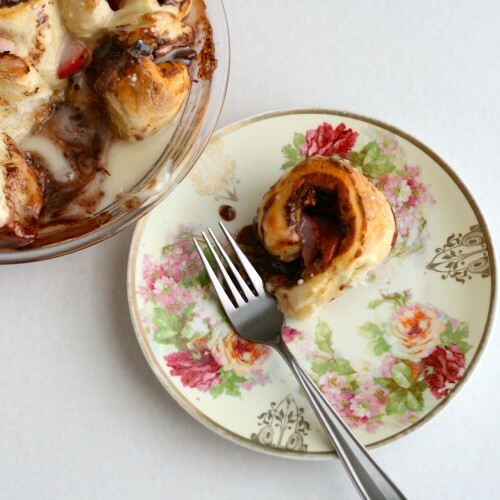 And I promise if you love chocolate, Nutella specifically, + strawberries you will love these rolls. As a food blogger I am trying to stay current with the next food celebration/holiday on the horizon. Valentine’s day seems to be a pretty chocolate-sentric food holiday and I know these rolls will make an appearance on Valentine’s day for my littlest Valentine’s. Kasper licked the plate clean. He even said “so so so yummy mommy.” Which to be honest is a compliment of the highest regard. “These sound fantastic, but Jamie I am afraid of bread baking.” No worries! I cheated and took a major short cut that you will love. I grabbed a loaf of frozen bread dough (I used Rhodes brand white bread which I love, use whatever you can find). Set the frozen loaf of bread out when you go to bed and it will be ready to work with in the morning. 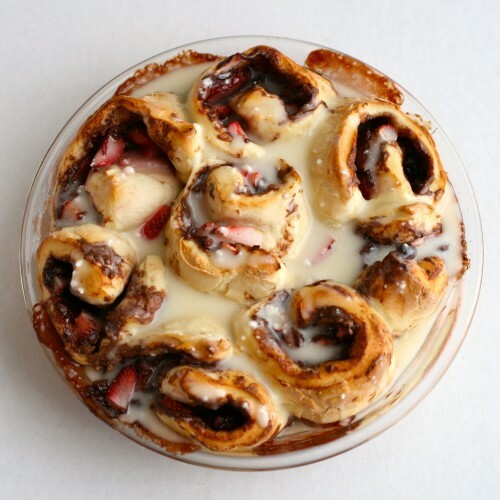 Â In the morning roll out the dough to make a large rectangle (9 inches x 15 inches), spread warmed Nutella over the dough, top with chopped fresh strawberries, roll up, and slice into rolls. Pop them into the oven and in about 25 minutes you will be in chocolate strawberry heaven! The night before set out frozen bread dough to thaw out, according to package directions. Place in greased pie plate or 8x8 baking dish. In small bowl mix together all ingredients until smooth. Oooo I love Nutella and rolls. What a great idea to stuff these rolls with everything yummy. I agree these should be breakfast for Valentine’s Day! Drooling! 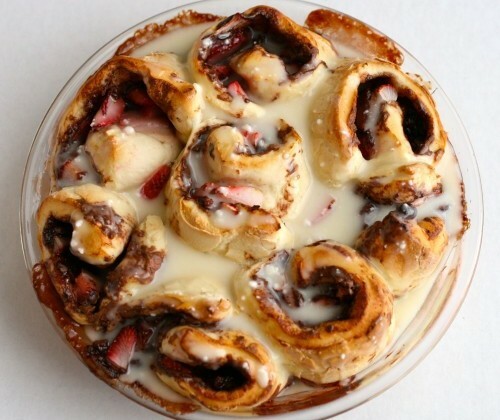 I love anything strawberries and I can imagine that these nutella rolls are amazing! These sound DELICIOUS! Of course….anything with Nutella does….right!? Thanks so much for sharing at Saturday Night Fever!